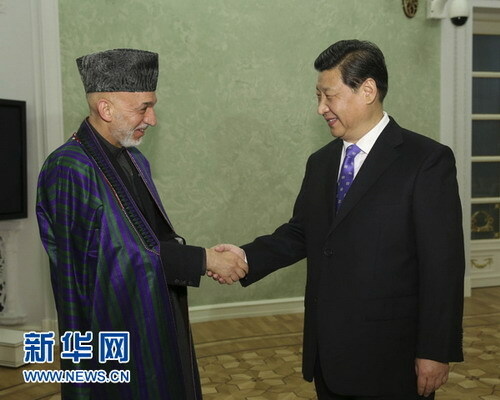 On February 7, local time, President Xi Jinping met with President Hamid Karzai of Afghanistan in Sochi, Russia. Xi Jinping noted, China highly values relations with Afghanistan and is willing to maintain high-level exchanges with Afghanistan, to promote friendly exchanges and cooperation, so as to push for unceasing development of China-Afghanistan relations. China is willing to continue the help within its ability for peaceful reconstruction of Afghanistan, especially help with personnel training in various fields. China supports competent Chinese companies to invest and develop their business in Afghanistan. Hope that the Afghan side will create a safe environment for bilateral cooperation. China is ready to strengthen cooperation with Afghanistan in combating the "three evil forces" as well as transnational crimes. 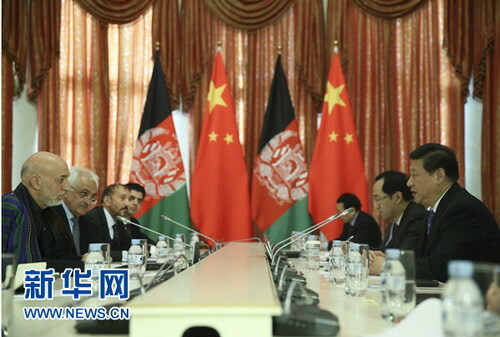 Xi Jinping stressed, China will continue to firmly support Afghanistan for the efforts for safeguarding state independence, sovereignty and territorial integrity, and support an “Afghan-led and Afghan-owned” national reconciliation process. The year 2014 is a critical year for Afghanistan's transition. China sincerely hopes that the Presidential election in Afghanistan will go smoothly and that Afghanistan will achieve a steady transition and move towards lasting peace and stability. Xi Jinping pointed out, after the year 2014, the destiny of Afghanistan will be more closely linked with that of countries in the region. China supports Afghanistan for being integrated into regional economic cooperation. China will host the fourth Foreign Ministers’ Conference of the Istanbul Process on Afghanistan in August. We are ready to work closely with the Afghan side to ensure success of the Conference. China is as well willing to push the SCO to play a greater role on the Afghan issue. Karzai expressed that he paid a successful state visit to China in September last year, which deepened his understanding of China and strengthened mutual trust and cooperation between the two countries. The Afghan side thanked China for its understanding of and support for Afghanistan. In a few months, the new President and government of Afghanistan will be elected. He believes that the new Afghan government will continue to attach importance to developing friendly cooperative relations with China. Karzai briefed the current situation in Afghanistan. He expressed that the Afghan government will continue its committment to promoting reconciliation and reconstruction, to realize stability and tranquility in the country. The Afghan government will maintain good-neighborly and friendly relations with neighboring countries and make efforts for safeguarding regional peace and stability.